Denture pain is something that a lot of people don't expect when they finally get their last teeth taken out. They figure that with no teeth, there's no toothache! Unfortunately, dentures can cause almost as many problems as teeth! This is one reason why most dentists are so keen for you to keep as many teeth as possible for as long as possible. Once they are all gone, you face a different set of problems. 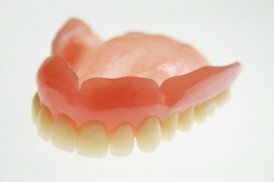 You have to remember that removable dentures are artificial acrylic teeth. They are an alternative to NOT having teeth. For most people, they are nothing like real teeth - they are foreign objects in your mouth. So we are doing quite well when removable dentures work at all! How can you get denture pain? The most common cause of pain with dentures comes from a simple irritation, where the dentures are moving slightly when you eat and talk. The dentures are rubbing on the gum. There's nothing wrong with the dentures as such - but the way they move can irritate the gum. The best solution here is to apply a thin smear of aloe vera gel inside the denture before you put the denture in. The aloe gel has antiseptic and anti-inflammatory properties, and will reduce the redness and swelling where your gum is sore. It's remarkably effective! BUT you have to use a high-quality gel, and I recommend the Forever product. You can read more about this, and order your aloe gel directly online HERE. There are NINE other major possible causes; check out my full list below - you can probably identify the cause of your denture pain, and see what the remedy is! Pressure points. This is where the denture just doesn't fit properly. The inner surface is a slightly different shape to your gums, and in 1 or 2 areas it may tend to press harder when you bite on something. This can cause a simple denture irritation, or progress to full-on denture pain. The remedy here is get your denture re-lined, if it is only a few years old and you are happy with the appearance of the teeth. Or just get a completely new denture if the problem one is more than 5 years old. Tags of acrylic inside the denture. With new dentures, there can be a few small tags of acrylic from the final processing left inside the denture. These are usually quite small, but can be very sharp, and cause denture pain. It can be hard to see exactly what it is that is digging in to your gum when you put the denture in! But once the problem spot is identified, it's a matter of seconds for the dentist to polish the tag off. Over-extended edges. If the edges of the dentures that fit under your lip and next to your cheeks are a bit too long, they will start to press and may cause an ulcer after a while. 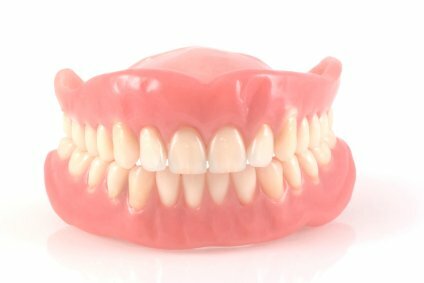 Frequently, the denture will also be a bit loose, because when you move your mouth, your cheek or lip will press on the denture edge and tend to push the denture out of position. The remedy is for the dentist to carefully remove some acrylic from the problem area. Sharp edge at the back of the palate. On an upper denture, to get the best possible "suction" and fit, the back edge of the denture will extend back along the roof of your mouth to the end of the hard palate, stopping just before it reaches the soft palate. This is because the soft palate can move, and would dislodge the denture when you speak. In order to get a good seal along this edge which runs from left to right across the back of your hard palate, dental technicians put a small ridge onto the back edge of the denture, so that it "digs in" a tiny bit. Normally this just gets you a better seal at the back of the denture, and you don't notice it. But sometimes it can dig in a little too much, and you DO notice it - as denture pain! The most common spot is right in the middle of the palate, because that's where the gum is thinnest, as it sits over a little lump pf bone just there. Again, once this spot has been identified as the cause, it's a matter of seconds for the dentist to polish it down. Nerve compression. This tends to happen in older folk, who have had full dentures for many, many years. The lower jaw shrinks down bit by bit. As it shrinks down, it starts to expose a small hole on each side of your chin where a nerve called "the mental nerve" (honestly!) comes out. If enough bone around this nerve is lost through shrinking, it's possible for a lower denture to start pressing on the nerve. This can give a sharp pain when you bite on something. This can be a tricky one to fix; the dentist has to either hollow out the denture a little bit in that area to stop any pressure on the nerve, or sometimes he can add a little bit of a special "soft" acrylic that keeps a rubber-like consistency when it sets. The soft acrylic also reduces the pressure in that area. Unfortunately it tends to become harder over a period of months, and must be replaced every so often. An uneven bite. When you bite your denture teeth together, they should all meet evenly, without any one tooth hitting first. If one or two teeth DO hit first (especially lower front teeth), it can start to make the gum underneath sore. Unfortunately, sometimes it can be hard to tell if the teeth are all meeting evenly, because you don't have any individual nerves to individual teeth on the denture, like you do with natural teeth. AND the gum can "give" a little under the denture, allowing it to sit in a slightly different position when biting firmly. Thin gum tissues. If the gum tissue over the jaw bone is thin, it cannot take as much pressure as thick gum tissue. As we get older, the gums gradually get thinner, and it becomes more common to get pressure spots due to the gum being so thin and fragile. This can be a real problem. The denture fits well, there are no tags, and no sharp edges. But the gum tissues are simply too thin to bear much weight on them. Sometimes we can use a soft lining inside the denture in the problem area. This is a special type of acrylic that remains slightly soft rather than setting rock-hard. The whole of the inside of the denture is lined with this material, which is slightly rubbery. But over time this material will lose its flexibility and need to be replaced, otherwise denture pain will creep back. A bone fin. This is similar to having thin gum tissues, but is made worse by the shape of the jaw bone under the gum. It can be thin and pointed, like a fin or a blade. The gum over the pointed bit of the bone fin is very easily traumatised, and quickly becomes a source of denture pain. Fortunately, this is relatively easily fixed. Your dentist or oral surgeon can remove the sharp edge of bone from under the gum, and make it more rounded and able to resist pressure. It's a small procedure that's generally all healed up inside 2 weeks. An old root. This is an odd one! You may have had your last tooth taken out years ago. But maybe one or two teeth broke as they were being removed. If the root fragment remaining was small, the dentist may have decided that it was safe to leave, rather than putting you through significant oral surgery just for a small bit of tooth. However, as the jaw bone shrinks over the years, it's possible for an old root to become exposed. This can irritate the gum, causing a sore spot under a denture. It's easy enough to fix; just get the root removed! A buried wisdom tooth! This is a similar situation to the retained root, but this time it's a wisdom tooth. Over the last 30 years as a dentist, I have seen this happen about 5 or 6 times. As the gum shrinks down over the years, it's possible for a buried wisdom tooth to become exposed. Unfortunately this is a bigger job to fix, as there is a whole tooth under the gum to remove, rather than just a root fragment. A referral to an oral surgeon is probably the best course of action. After the jawbone has shrunk down around a wisdom tooth, the wisdom tooth itself will be occupying a big socket, with only a thin layer of bone around it. This means that the jawbone is now significantly weaker, and the oral surgeon will have to be very gentle when removing the tooth in order to avoid a jaw fracture. So there you have it, a number of possible causes of denture pain. BUT there is one other possible cause of denture pain - and that is a small tumor starting somewhere. The most common areas are on the side of the tongue or under the tongue, and on the roof of the mouth. You can read more about this rare possibility HERE and HERE. So don't put up with a sore mouth if you are getting some denture irritation. Get it checked by a dentist, and if it doesn't feel better within a week, go back to him again. These things are much more easily fixed if they are detected early. If you're still not happy after a second visit, go to a different dentist. After all, it's YOUR health at stake!